How the ice cream cones made? Home/News Sirvent/How the ice cream cones made? Today in Sirvent Horchateria we want you to know as the cones of the richest city of Barcelona made ice cream. 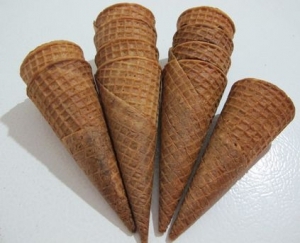 First do a little review of the history of this fantastic product are the cones. Cornets were already mentioned in 1825 in French cuisine books when Julien Archambault described a cornet made by rolling up “wafers”. Another printed reference to an edible cornet appears in Mrs A. B. Marshall’s Cookery Book, written in 1887 by Agnes B. Marshall (1855-1905) in England, an innovative influential published two cookbooks and took a cooking school. His recipe for a Cornet with cream says “cornets were made with almonds and baked in the oven, not pressing between plates”; thus he was born the ancestor Cornet as we know it today. The idea of selling an ice cream cone frozen (so that cone and ice cream were a single product, storable in a freezer) was an old dream of ice cream makers, but it was not until 1928 when JT Stubby Parker of Fort Worth (Texas) created an ice cream cone with these characteristics. To market it he founded the The Drumstick Company in 1931, which was bought in 1991 by Nestlé. In 1959, Spica, an Italian ice cream maker based in Naples, invented a process to isolate the interior of the wafer cone with a layer of oil, sugar and chocolate. Spica recorded the Cornetto brand in 1960. Initially sales were bad, but in 1976 Unilever acquired Spica and launched a massive marketing campaign throughout Europe, which he currently is one of the world’s most popular ice cream. But you know how the ice cream cones made? If we have all these ingredients over the marble of our kitchen, and we are ready to make a good home for our ice cream cones. First we will put 100 grams of sugar in a bowl, and add the cream “bain-marie” gradually we add the sifted flour mixed with baking powder and dust cherries. After everything into the bowl, we mix vigorously with the help of tools like may be an electric beater. What mix until well-blended. And we use a preheated wlafera followed for roasting. Once we remove our walfera, the mass is rapidly solidify, is why if we make our ice cream cones (cornets) we must do so immediately. Just after removing from the mold it walfera immediately, especially have to take care not to put too thick mass between the hot molds of the device. Walfera comes with a cone to help us make the shape of the cone. When we wind on the cone the dough is ready to shape of cone it is important that the dough is still hot when it is shaped, if already hardened we can not, because as we said before, the mass Cornet is It hardens very quickly. They are so beautiful and they are so rich, now is fill only what you like What do you have in mind? If you follow this recipe going to be able to enjoy the best ice cream cones in the Horchateria Sirvent we know and use in our own home.